This famous saying was intended as a piece of personal wisdom. The vast majority of the world today ignores this advice. Whether at the personal, business, or government level, borrowing and lending have become commonplace in modern life. In fact, it is almost impossible to participate in buying or selling without borrowing and/or lending. When a person borrows from a business, or from the government, it is a formal and legal endeavor, which makes disputes between the parties a complex matter of the law. The same is true for a business borrowing from another business, or a government borrowing from a business or another government. If these intricate transactions run afoul and the borrower cannot pay back the lender, eventually the activity known as bankruptcy comes into play. This ‘remedy’ is used by individuals, businesses, and governments. America’s National Debt may be heading toward bankruptcy for the nation. It is a ticking time-bomb waiting to blow the economy sky-high. The law today does not allow states to officially claim bankruptcy. However, that doesn’t mean that states cannot go into default on loan payments. In fact, a Zero Hedge article from 2010 names 32 states that were insolvent at the time. California (surprise, surprise!) was the most in debt, followed by Michigan and New York. These cases were never officially bankrupt because the states were allowed to borrow money from the federal government. To be clear, this was not a case of ‘robbing Peter to pay Paul.’ It was more like the court jester begging the emperor for some of his invisible clothes. The Federal government, i.e. the emperor, lends money that it has to borrow, to the states to pay back money that they didn’t have to meet their legal obligations. It amounts to going into additional debt to pay the debt you already have. It is obvious this doesn’t solve the debt problem. It only perpetuates the myth that states cannot ever go bankrupt. When such conditions exist, one of the many inevitable results is higher taxes. It is far less the case that significantly lower government spending is attempted or even considered, at least initially. The case is even more destructive when we realize that sovereign nations can suffer the consequences of rampant debt. Most are familiar on one level or another the phenomenons of personal and business bankruptcy. However, most are not as aware that even governments of entire nations can go bankrupt. One prominent example was the nation of Greece which was threatened with insolvency a decade ago. Greece survived the economic crisis because the European Union and the IMF bailed the nation out. The EU and the International Monetary Fund provided 240 billion euros in emergency funds in return for austerity measures. The loans only gave Greece enough money to pay interest on its existing debt and keep banks capitalized. The EU had no choice but to stand behind its member by funding a bailout. Otherwise, it would face the consequences of Greece either leaving the Eurozone or defaulting. Greece had to agree to a revamping of its revenue system so that the national budget could take severe steps toward being ‘in the black,’ to receive the funds. That meant mandatory tax increases and spending cuts. It also meant forced wage cuts and stopped any early retirement. The agreement also meant that pension funds had to be cut which also meant government-funded pensions would not be able to honor their legal obligation to pay their retirees. These measures were either ineffective or not given enough time, and several other smaller billion-dollar-plus ‘bailouts’ were sent to Greece via various channels of the EU. Unemployment shot up to 25% and to 50% for young people. By 2015 the voters had enough of the austerity measures forced upon them by the EU bailouts. In a referendum vote, they rejected the measures triggering widespread fear of instability which resulted in a run on the banks. Banks closed and restricted ATM withdrawals to 60 euros per day. It threatened the tourism industry at the height of the season, with 14 million tourists visiting the country. The European Central Bank agreed to recapitalize Greek banks with 10 billion euros to 25 billion euros, allowing them to reopen. Banks imposed a 420 euros weekly limit on withdrawals. That prevented depositors from draining their accounts and worsening the problem. The Greek economy has limped along since 2015 and though there has been some small progress, the debt is still in the 300 billion euro range, about the same as it was 10 years ago. Additionally, unemployment is still at 22% and, as of 2018, Greece is seeking more bailouts contingent on even more strict economic control by the EU. The official National Debt is now quoted as over 22 trillion dollars! How much money is that? Think of it this way. If you had just 1 trillion dollars and you spent 1 million dollars every day, it would take you almost 3000 years to spend it. Multiply it 22 times and that is how much the United States of America owes a lot of other nations and financial institutions aka, banks around the globe. Now for some really bad news, this means the people of the United States owe that money because the taxpayers ultimately supply the funds. This means that each taxpayer in America owes approximately 250,000 dollars to places including China through its state-controlled institutions of finance. Here comes the worst news of all; 22 trillion is only a small part of the real National Debt. That’s because the official dollar amount does not include America’s unfunded liabilities. Unfunded liabilities are those items the Federal government must pay for by American law. By far the largest and most significant of these are Social Security, Medicare, and Medicaid. Together they currently total more 50 trillion dollars. When added to the Debt, the total becomes slightly more than 73 trillion dollars… for the moment. The final figure also includes items such as Federal pensions for workers and elected officials and interest paid on the Debt. The grand total of America’s real debt is about 130 trillion dollars! This means each American taxpayer owes over 1 million dollars of the real debt as it exists today. So, what do you say, fellow taxpayer? Got an extra million to chip in for poor old Uncle Sam? Yeah, me neither. This is a path which will lead to the eventual bankruptcy of America unless some radical steps are taken, steps that will be extremely difficult to accomplish. Which leads to the second treacherous factor that is unique for America. In all other examples of national financial disaster, there exists one thing which America doesn’t have. There is no one to bail us out. The fact is, a consortium big enough to rescue the U.S. from insolvency doesn’t exist. America is the largest economy in the world and no nation or bank or group of nations or banks could ever absorb over 100 trillion dollars of debt. This leaves few choices on the table, and none of them are easy or very pleasant. Americans must understand that even the best choices to resolve this economic upheaval will involve significant sacrifices by ‘we the people’ ourselves. Any real solution to stave off national insolvency requires massive changes in how unfunded liabilities are handled. The political landscape at this time makes the task of solving that problem extremely difficult. However, there is a glimmer of hope here precisely because America is the largest economy that exists. Most of the modern world at this time has a vested interest in keeping it that way. If America’s economy collapsed, it would immediately plunge the world into crisis mode, perhaps even global economic depression. That real fear gives the nation a short window of opportunity to make strides toward fixing the precarious debt situation. This doesn’t mean we will pay off the National Debt completely, though there are ways to do so, provided the problem of government overspending is corrected. An intriguing and workable idea to pay down the debt is a 10% special inheritance tax described here. The 10 percent taxes government share should be used exclusively to pay down the National Debt. The presently estimated wealth in the USA is 100 trillion. Ten percent over time being paid to reduce the debt will exponentially reduce the debt, assuming Congress attempts to balance a budget. The fact is that at the bottom, a crisis of economics is really a crisis of confidence. As long as there is trust in the value of the currency, public assurance staves off panic moves such as a run on the banks. The same thing is true about America’s creditors. Those institutions and nations we are indebted to do not require payment in full to remain confident about doing business with the U.S.A.
All that is needed (for now) is to show we are keeping up on the interest payments and making progress in reforming our spending habits as a nation. Then real strides can be taken to pay off the National Debt. Government spending overall has to be reigned in if a balanced budget is to be achieved. An excellent piece at Townhall.com shows this could be accomplished in a simple manner by a small reduction in spending. The solution to this problem is very straightforward. All that’s needed is a bit of spending restraint to put the budget on a glide path to balance. 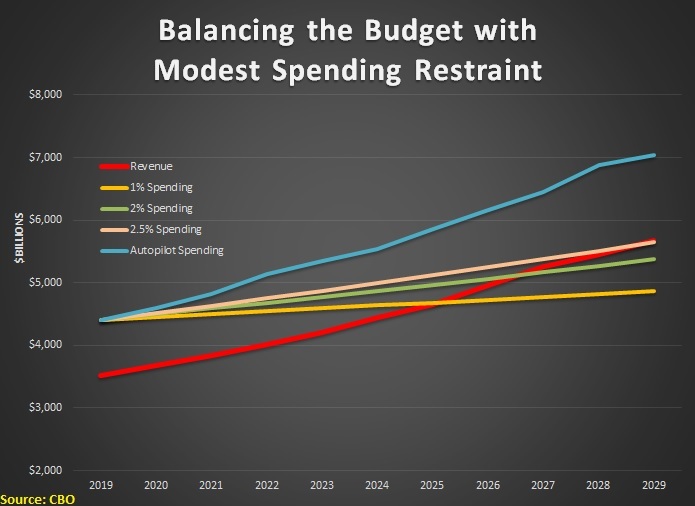 I’m a big fan of spending caps, so this next chart shows the 10-year fiscal outlook if annual spending increases are limited to 1% growth, 2% growth, or 2.5% growth. The ‘autopilot’ spending in the chart represents the current and projected levels of government outlay. The big reason this ‘autopilot’ is headed to the stratosphere is out of control entitlement spending. Getting it under control means addressing the problems of Social Security and Medicare insolvency. For example, raising the retirement age for collecting Social Security to 70 along with at least some privatization of SS and Medicare, would be a good start in the right direction. However, no one in political leadership is even suggesting slight changes in entitlement programs at this point in time. Those leaders assume, quite correctly, that many of their constituents would go ballistic at the prospects. Those most adversely affected would be people in their 40s and 50s who may have already been counting on retiring in their 60s. Many of them may not want to wait until 70 for Social Security or Medicare benefits. That kind of potential ill-will from voters keeps too many politicians from facing the truth. The truth that this problem is an economic ticking time-bomb and its detonation would be unimaginably catastrophic for America and the world. It is going to require strong and responsible leadership in government to stay the course if spending restraint is going to happen. Some may realistically face a hostile constituency when supporting proposals that delay or ‘cut’ government benefits and end up potentially sacrificing their political lives. A strong and responsible public also must emerge and become educated enough about the economic realities to support policies which may call for sacrifice from them. Is it fair? Not really. The largest sacrifice is likely required from working families who have already borne the burden of past generations of fiscal foolishness. However, it is also true that should the debt time-bomb explode, the same working families will suffer the most devastation and it will dwarf the pain of previous sacrifices. Unless some big changes are made the bomb will go off, it’s just a matter of time. The countdown to detonation may have already begun, and it is certain the debt time-bomb is armed. Pray that America will be wise enough to make the essential sacrifices and bring us back from the economic precipice. Not to add insult to injury (well, maybe), does that colossal final debt tally include egregious spending on illegals now flooding our interior?? As far as the numbers go, they would only reflect current spending. Some like Border Patrol and ICE would be accounted for but the cost of social services wouldn’t be in future estimates. There is no way to know the answer because it has always been assumed that National Emergencies are short-lived. The longer the border crisis continues, the greater impact it could have. But after 100 trillion, it doesn’t really matter. The numbers become absurd. After all, how we can solve this problem? It won’t be easy. As I noted, some sacrifices need to be made by both political leaders and the people themselves. We need to stop electing people who promise to give us money or benefits and start demanding fiscal accountability from our leadership. That, and a lot of humility before God and praying for His aid are good places to begin. Yes, but is difficult to elect, because they are not in to keeping promises, not only about money, but in general..